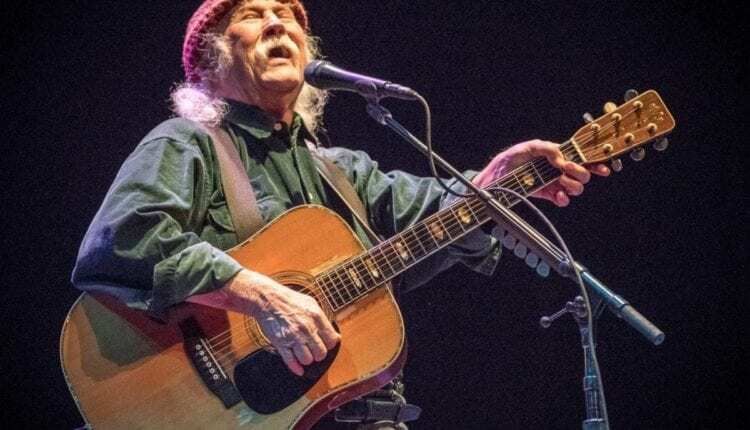 David Crosby brought his friends to The Egg on Friday, November 17 for a sold out performance that featured tracks off his new album Sky Trails, as well as songs from the 60’s and 70’s by CSNY, CPR and The Byrds. Crosby’s Friends this evening included Jeff Pevar on guitar, James Raymond on keys, Mai Agan on bass, Steve DiStanislao on drums, and Michelle Willis on keys and vocals. 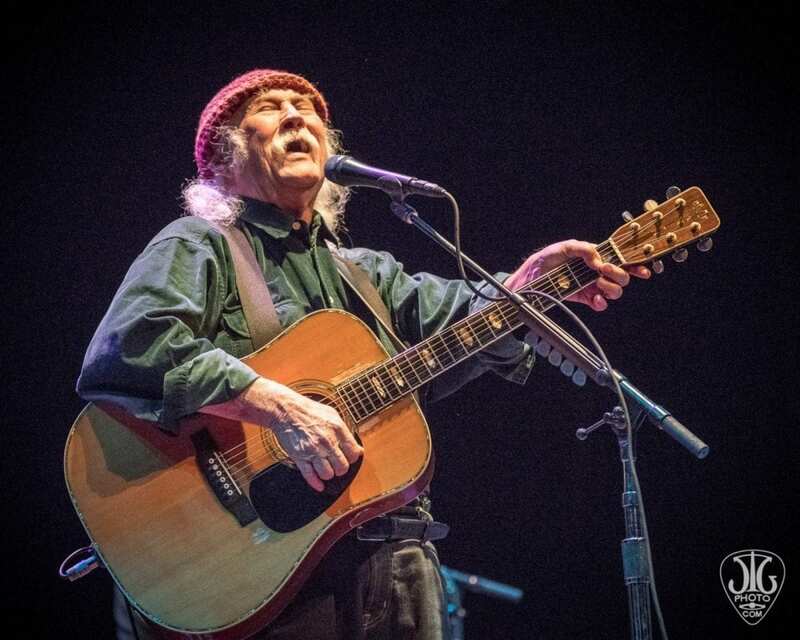 Shortly after opening with “In my Dreams,” a prime sample of Crosby, Stills and Nash’s late 70s elevator rock sound, Crosby dove into the first of a few CPR tracks, “Morrison” and later “At the Edge” and the powerful “Breathless,” as he spread out his vast catalog throughout the evening. After a show in Boston that had an audience member taking issue with Crosby’s anti-Trump stance, there were four instances this evening where he took jabs at Trump, with no vocal disdain from the audience. There was also the groovy “She’s Got to be Somewhere,” a song about a spy, influenced by Trump, and the first track off Sky Trails. Crosby shared stories throughout the evening, the first about The Byrds touring in England for the first time in the 60s, and told of how they were scared to meet The Beatles because they had copied their look, clothes, hair, shoes, sound and all. While performing one night, Crosby saw Mick Jagger and John Lennon in the crowd, and while he was nervous to meet either of them, they were as mellow as could be when they got to talking after the show. This led to Crosby offering a Ravi Shankar album to George Harrison, which had a profound influence on the quiet Beatle and his music in the years that followed. Crosby and Friends then performed “Laughing” which was written for Harrison. The touching CSN classic “Guinevere” was followed by referencing the Boston audience member, leading Crosby to wonder if “maybe they thought it was a Stephen Stills show,” before discussing the impact of Eisenhower’s “Military industrial Complex” speech and how it had an early influence on his view of American politics. With cheers and applause from the audience, he briefly spoke against the buying of Congress (and how there may only be five good ones left), which led into the short acapella song from an era of protest against the Vietnam War “What are their names?” Keeping the spirit of the era alive, a pairing of “Long Time Coming” and an extended “Deja Vu” with a soft jazzy interlude closed the first set. “Delta,” a song written on Warren Zevon’s piano (thanks to Jackson Browne when he was helping Crosby get clean) and “My Country Tis of Thee” with a CSN spin on the American staple stood out in a shorter second set. An encore of Neil Young’s “Ohio” had Crosby encouraging the crowd to sing the chorus “Four dead in Ohio,” and left the audience emboldened to take the spirit of the era from which these songs were born. While the show had plenty of reminiscing, Crosby’s show was far from a novelty act or nostalgia show. There were a few songs from his forthcoming album Sky Trails that were performed this evening amid plenty of classics from across his Canon. The 76 year old showed no signs of slowing down or mailing in his performance as he heads into the twilight of his career. Crosby is fired up and ready to go.